This is a list of the aquatic invasive species that are currently in Calumet County. Click on the picture to see more information about that species. 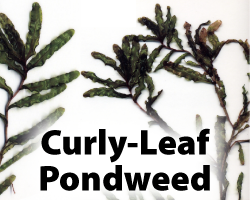 Curly-leaf pondweed has become established in Lake Winnebago and in Becker Lake in Calumet County. The leaves are reddish-green, oblong, and about 3 inches long, with distinct finely toothed wavy edges. The stem of the plant is flat, reddish-brown and grows from 1 to 3 feet long. The plant usually drops to the lake bottom by early July. Curly-leaf pondweed spreads through burr-like winter buds called turions. The plants also reproduce by seed, but this plays a small role compared to the vegetative reproduction through turions. New plants form under the ice in winter, making curly-leaf pondweed one of the first nuisance aquatic plants to emerge in the spring. It becomes invasive in some areas because of its tolerance for low light and low water temperatures. These tolerances allow it to get a head start on and outcompete native plants in the spring. In mid-summer, when most aquatic plants are growing, curly-leaf pondweed plants are dying off. This is why it is frequently missed when monitoring for Eurasian water milfoil in mid to late summer. Plant die-offs may result in a substantial loss of dissolved oxygen. Additionally, the decaying plants can increase nutrients which contribute to algal blooms. Curly-leaf pondweed forms surface mats that interfere with aquatic recreation. Maintaining a healthy ecosystem with diverse native aquatic plants and animals as well as minimizing nutrient and pollutant inputs will deter invasions. Once introduced, curly-leaf pondweed spreads rapidly. Long-term management requires the reduction or elimination of turions to interrupt the lifecycle. Department of Natural Resources permits are required for chemical treatments, mechanical treatments, and some manual treatments. 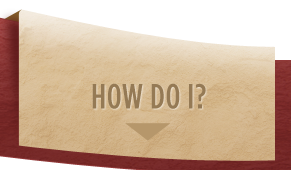 For further information on chemical controls, visit the DNR website. Manual/mechanical control efforts should be undertaken in the spring or early summer. Mechanical control includes raking, hand-cutting or harvesting vegetation. Raking and hand cutting remove plants at the sediment surface, and there is some evidence that early season cutting of pondweed can prevent turion production. Harvesting generally removes the top 5 feet of the plant. But be careful with your identification when you harvest. Becker Lake also has the native clasping leaf pondweed, an important part of our desired aquatic vegetation. Curly-leaf pondweed can spread from turions and plant fragments, so it is important to clean all vegetation off boats and equipment before leaving water access. Remember to inspect all your equipment, remove attached plants or animals, drain all the water from your equipment. In 2009, Eurasian water milfoil (EWM) was found and confirmed in Becker Lake. The residents of Long Lake in Manitowoc County have been battling this plant for years. Now it's in Becker Lake, too. It has been a problem on Lake Winnebago for many years. EWM is the only non-native milfoil in Wisconsin. It has slender stems whorled by feathery leaves and tiny flowers produced above the water surface. The leaves are threadlike, typically uniform in diameter. 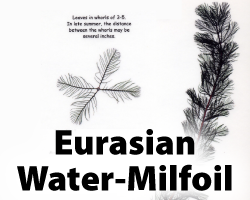 Eurasian water milfoil has 9-21 pairs of leaflets per leaf, while the native Northern milfoil typically has 7-11 pairs of leaflets. EWM reproduces vegetatively by fragmentation. The plant produces fragments after fruiting once or twice during the summer. These shoots may be inadvertently picked up by boaters. EWM is readily moved between waterbodies by boats, motors, trailers, bilges, live wells, or bait buckets, and can live for weeks if kept moist. Once established, EWM reproduces from shoot fragments and runners that creep along the lake bed. It spreads rapidly by fragmentation and blocks out sunlight needed for native plant growth often resulting in monotypic stands, threatening the integrity of aquatic communities. Dense stands of EWM also restrict recreational uses like swimming, boating, and fishing. EWM may also lead to deteriorating water quality and algae blooms in infested lakes. Lake managers and lakeshore property owners should check for new colonies and control them before they spread. The plants can be hand pulled or raked. It is imperative that all fragments be removed from the water and the shore. Hand pulling is the preferred control method for small colonies. The process is thorough and selective (not to mention time-consuming) yet special care must be taken to collect all roots and plant fragments. Chemical Control: Herbicide treatment is not recommended because it is typically disruptive to aquatic ecosystems and not selective in the vegetation it affects, thus threatening native plants. EWM spreads vegetatively by plant fragments, so it is important to clean all vegetation off boats and equipment before leaving water access. Remember to inspect all your equipment, remove attached plants or animals and drain all the water from your equipment. Rusty crayfish are native to streams in Ohio, Kentucky, Illinois, Indiana, and Tennessee. They were probably introduced into Wisconsin waters by anglers who used them as live bait. Rusty crayfish can usually be identified from our native species by their larger, more robust claws. The claws also have dark bands on the tips. They also display rusty spots on each side of their carapace. These spots are located on the body as though you picked up the crayfish with paint on your forefinger and thumb. The spots may not always be present or well developed on rusty crayfish from some waters. Rusty crayfish are common in many of our county inland rivers and streams, as well as our neighboring counties. Rusty crayfish eat small fish, insects, and fish eggs. They are aggressive and can displace native crawfish and can reach higher densities. They also consume more food than our native crawfish, acting like little lawn mowers, destroying underwater habitat that is important for fish spawning, cover, and food. Rusty crayfish are prolific. The females lay from 80-575 eggs! To make it even worse, female crayfish actually store sperm until they are ready to release their eggs, so adding just one crawfish to a waterbody can start an infestation. 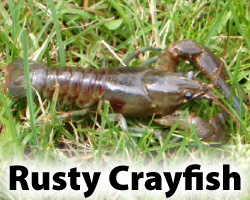 The rusty crayfish is not to be confused with the red swamp crayfish which was found in Germantown, WI in 2009. 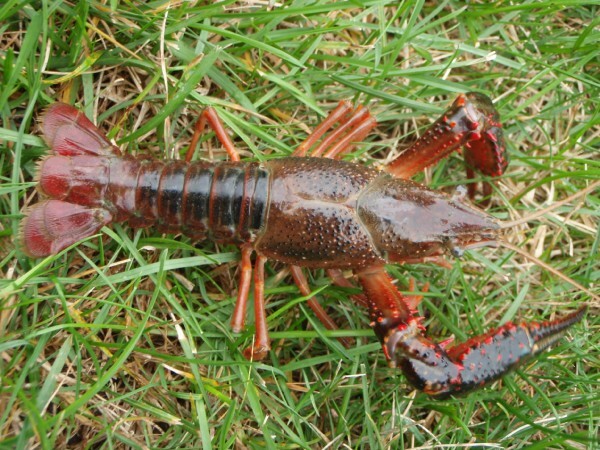 The red swamp crawfish are dark red with raised bright red spots covering the body and claws. They also pose a severe threat to our native lake and riverine ecosystems. For additional information on the red swamp crayfish, visit the DNR website. The damage and destruction these crawfish cause is the reason it is illegal to possess both live crayfish and angling equipment simultaneously on any inland Wisconsin water (except the Mississippi River). It is also illegal to release crayfish into a water of the state without a permit. A fishing license is required to harvest crayfish. 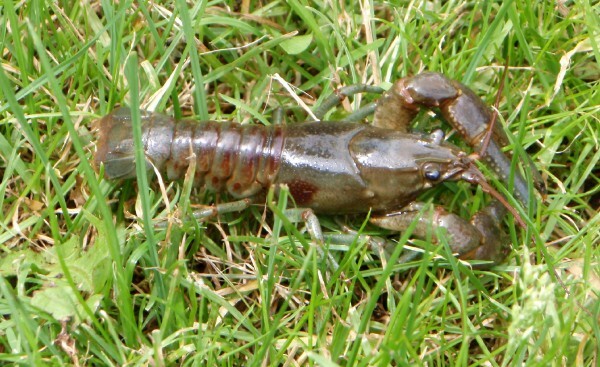 To prevent the spread of the rusty and red swamp crayfish, as well as other aquatic invasive species, never release any aquarium pets or plants in to the wild and always dispose of unwanted crayfish in the trash. Never release them alive. Instead, catch them and cook them. For recipes visit the Seagrant website, or you can get a "A Craving for Crayfish", a free booklet with ten recipes. There are zebra mussels in Lake Winnebago, but testing of Becker and Round Lakes in 2009 showed no zebra mussels in those waters- yet! Let's keep it that way. Zebra mussels are a tiny (1/8-inch to 2-inch) bottom-dwelling clams with a yellowish or brownish D-shaped shell, usually with alternating dark- and light-colored stripes. They can be up to two inches long, but most are under an inch. Zebra mussels usually grow in clusters containing numerous individuals. Zebra mussels are the only freshwater mollusks that can firmly attach themselves to solid objects. They are generally found in shallow (6-30 feet deep), algae-rich water. Zebra mussels usually reach reproductive maturity by the end of their first year. A fertilized egg results in a free-swimming larva called a 'veliger.' This veliger remains suspended in the water column for up to five weeks, and then begins to sink, eventually attaching to a stable surface (e.g., rocks, dock pilings, aquatic weeds, water intakes, boat hulls) on which to live, grow and reproduce. They attach to these surfaces with adhesive structures called byssal threads. 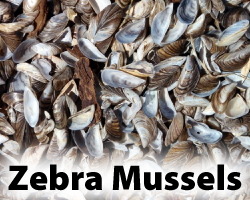 Zebra mussels also attach to the shells of native mussels in great masses, smothering them. Zebra mussels feed by drawing water into their bodies and filtering out most of the suspended microscopic plants, animals and debris. This process can lead to increased water clarity, but also to a depleted food supply for other aquatic organisms, including fish. The higher light penetration fosters growth of aquatic plants, and this thicker plant growth can interfere with boaters, anglers and swimmers. 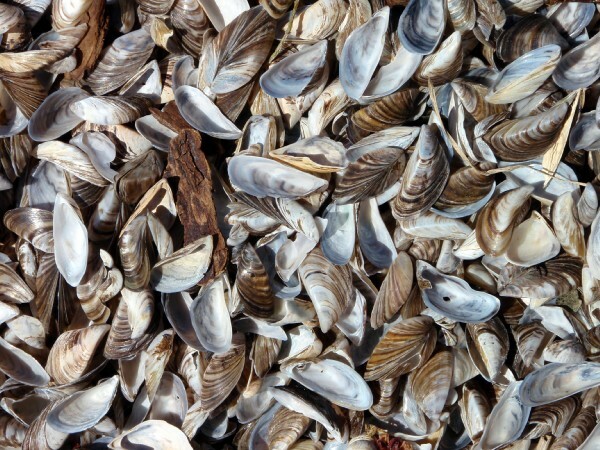 Zebra mussel infestations may also promote the growth of blue-green algae, since they consume other types of algae, but not the blue-green. Financial impacts have been staggering for Wisconsin's water utilities and to power plants, where these animals congregate on and clog intake and distribution pipes. From 2001 through 2009, We-Energies estimated that their control measures for zebra and quagga mussels and cladophora reached $28,429,000! Once zebra mussels are established in a water body, very little can be done to control them. Therefore it is critical to take all possible measures to prevent their introduction. 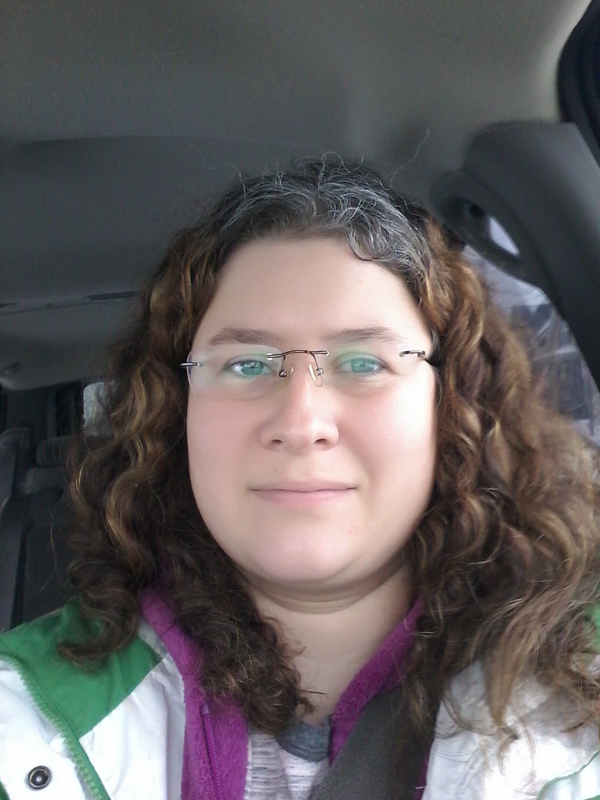 No selective method has been developed that succeeds in controlling zebra mussels in the wild without also harming other aquatic organisms. To a limited extent, ducks and fish will eat small zebra mussels, but not to the point of effectively controlling their populations. As of yet, no practical and effective controls are known for control, emphasizing the need for prevention. That prevention is to always inspect your equipment, boats, trailers, landing nets, decoys, and anything else that has been in the water. Remove any attached aquatic plants. Microscopic veligers and tiny zebra mussels can be hiding in the aquatic plants. Drain all water from all equipment, including the boat, boat trailer, boating or fishing equipment, including water in any bilge, ballast tank, bait bucket, live well or other container before leaving the launch. It's the law.